Robert Guédiguian was born in 1953 and has been making films since the early eighties, often using the same actors, especially the trio of Ariane Ascaride (to whom he is married), Jean-Pierre Darroussin and Gérard Meylan, and often set in and aorund Marseilles. ★★★★ "A treat for fans of French art house movies"
★★★★"Pierre Milon's shimmering cinematography ensures that the Calanque de Méjean provides an atmospheric setting for the musings on tradition, memory, depopulation, class and defying age, with the final sequence beneath the echoing arches of the railway viaduct being indescribably beautiful." ★★★★"The House by the Sea is certainly one to be visited not only for its stunning scenery and careful, sensitive and honest acting and direction but because it manages to address key controversial issues about immigration without ever preaching too overtly." ★★★★"A father’s legacy is minutely dissected in this stirring tale of regret, nostalgia and the true meaning of community spirit." 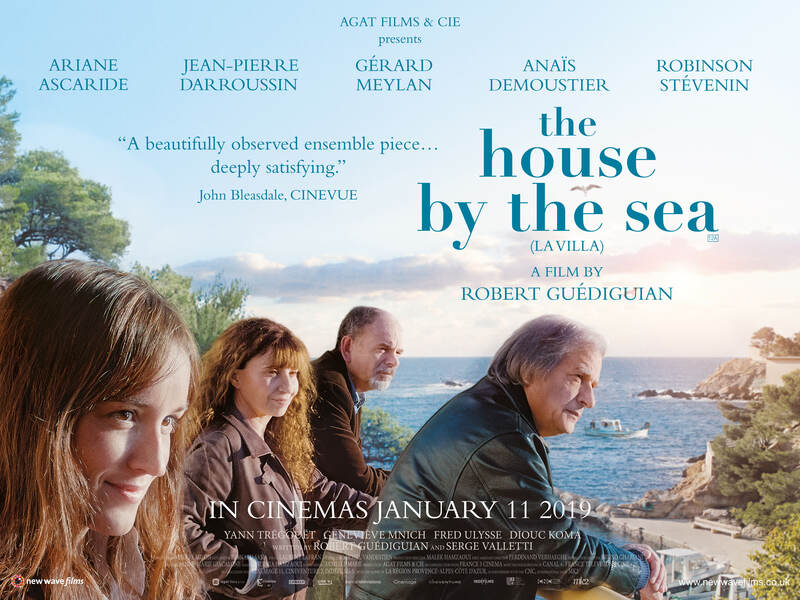 "The House by the Sea is an immensely intelligent and absorbing drama about the ties which bind families together."